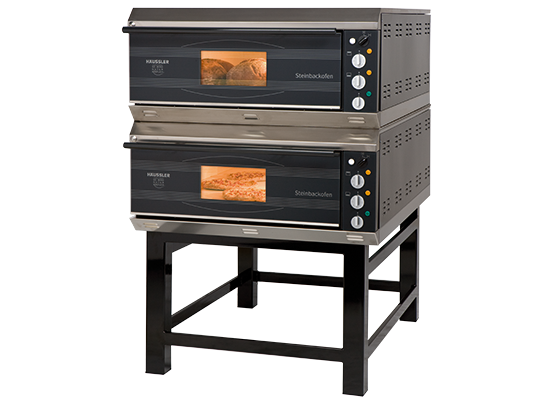 Häussler electric stone ovens combine the latest technology with traditional baking methods. 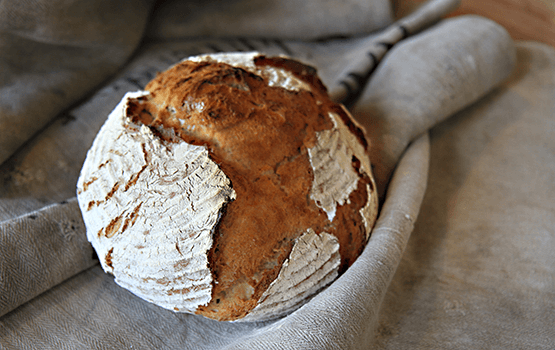 Delight your vacation guests and customers with hearty bread, savoury pizza, fresh pretzels and rolls, delicious cake and pastries in your catering business. Crisp suckling pig, pork knuckles and juicy roasts succeed beautifully and can now be offered in your restaurant. You will be astonished how easy it is to conjure up all these treats from your Häussler electric stone oven. The Häussler electric stone oven’s baking chamber is completely lined with fireclay bricks. As a result, the typical wood-burning oven effect is achieved. The upper and lower heat can be continuously adjusted in each model by two safety thermostats that can be regulated independently of each other from 50° C - 320° C. Monitoring of the temperatures in the baking chamber takes place via clearly visible control lights. The baking process can be optimally monitored through the large viewing window in the oven door and the internal illumination. As of INO 2004, a steaming system is integrated as standard equipment in order to bring additional moisture into the baking chamber if necessary. Maintenance of the bricks is very simple: sweep out the oven with a brush or wipe the bricks with a moist rag. It doesn’t get any easier! And if a spot should still stubbornly remain, tackle it with modern pyrolysis: set the lower heat at 320° C, leave it switched on for one to two hours and then after cooling off, wipe the bricks with a moist cloth. Easy of operation as well as the highest safety requirements are a given with all Häussler appliances. Decades of experience in oven manufacturing, our own production, high-quality materials and the strictest quality controls ensure the best baking results and a long service life of the appliances with low energy consumption. Your bakery, catering business or direct marketing will turn into a magnet for customers. Today one can buy bread anywhere – but to offer something special, only you can do that! Seduce your customers with an attractive experience: show baking in the stone oven. 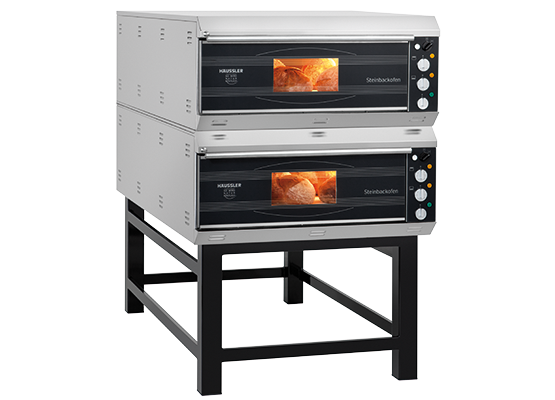 Warmly lit, the electric stone ovens from Häussler promise the most wonderful treats, give of an irresistible aroma of fresh baked goods and seduce with uncompromising freshness and storage life. The electric stone ovens awaken aromatic memories of grandmother’s time. These quality arguments usually will soon create a buzz and convince your customers. We hope you have a lot of fun with your new regular customers. As opposed to a conventional oven that is lined with sheet metal, the Häussler electricstone ovens are lined all around with fireclay bricks. As a result, they bake according to the principle of the wood-burning oven: load at a high beginning heat with fast crust formation. Bake with gentle, decreasing stored heat. The effect: baked goods that are perfectly baked through. Sealing moisture and the flavours in the baked good. As a result all baked goods are crusty on the outside, succulent inside and in addition keep fresh longer. Equal browning of the baked good, since the heat emission occurs from all sides. Upper and lower heat can be controlled separately. Hardly any condensation forms, since the full firebrick lining optimally absorbs moisture and gives it off again during baking to the baked goods. Fireclay is made of fired clay and is an excellent energy store. A equal heat radiation in the entire baking chamber achieves the best baking quality and saves energy at the same time! The electric stone ovens from Häussler store heat significantly longer than a conventional oven. This means a clear plus for your energy balance sheet - up to 40% savings, beleive it or not! The baking chamber is fully lined with fireclay bricks! Fast and effective energy consumption, since a direct heat transfer from the heating elements to the brick is assured. A long service life and minimal repair requirements, since the heating elements are protected in the brick. Energy-saving: you can bake for hours with the oven switched off - without any additional power supply! 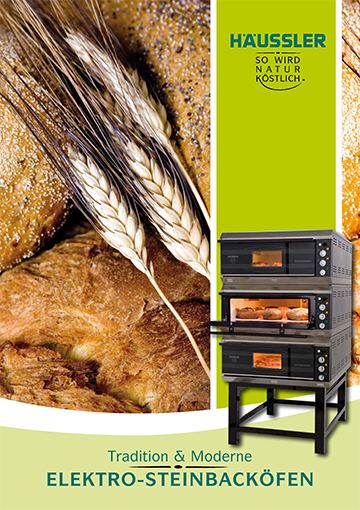 Wood-burning oven effect: baking, roasting, grilling - its so tasty with the Häussler stone oven! Crusty and succulent like from the wood-burning oven. Easy to use: heat up oven, switch off - bake! Easy to clean: absolutely without odour or taste again after each heating-up To clean the brick, simply just sweep out - and you’re done! 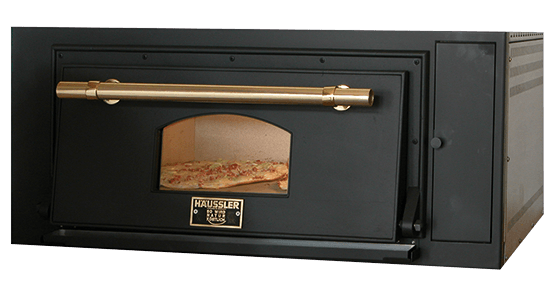 Häussler electric stone ovens can be used flexibly anywhere. Whether in the bakery or kitchen, for party service, in the catering trade, at a direct marketer or in a show area. 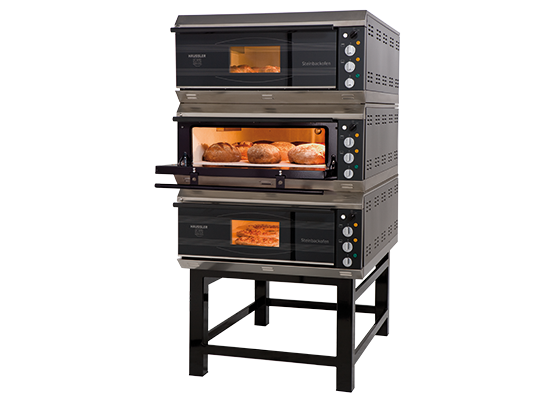 The consistent and special baking quality of our ovens guarantee you many satisfied customers! for the most part in the interior, even with an opened door. The storage effect of the firebrick and the good insulation of our ovens ensure a uniform heat distribution and consequently the best baking results. And this with up to 40% energy saving compared to a conventional design. Upper and lower heat continuously controlled by two thermostats from 50 to 320°. On request also up to 500° C available. Triple door glazing, large viewing window with thermal glazing, whose middle glass is coated with a transparent, heat-reflecting silver vaporisation. Prevents energy loss and supports uniform temperature distribution in the baking chamber. goes way beyond the statutory period. also friendly to right- and left-hander users along the entire door width. Not just a design element, it is also practical during daily use. The generously dimensioned baking chamber illumination for monitoring the baking process in all of the bread-baking oven models provides good visibility by a separate light switch even during baking. Stacking up to three tiers without additional spacers is also possible later. For an improved baking climate. Especially when there are several baking processes in succession, the outlet conducts excess air moisture out of the oven. You can easily direct a small amount of water into the vapour conduit through the filler pipe on the front of the oven. Excessive tearing of the crust is avoided by the resulting steam in the interior of the oven. With its baking surface of 70 x 70 cm, the INO 2004 provides space for approx. 9 loaves of bread à 1 kg, 6 large pizzas, 4 plaited yeast buns, 6 springforms or meat for up to 30 people. The INO 2004/2 holds approx. 18 loaves of bread à 1 kg on its two baking tiers. Both tiers can be heated independently of each other and operated separately as needed. The INO 2006 provides space for approx. 15 kg of bread. As with all of our ovens, successive baking is possible. The heating-up time is about 20 minutes; afterwards, the oven is hot for the next baking process. The INO 2006/2 provides space for approx. 30 loaves of bread per baking process. With its baking surface of 70 x 105 cm, it is identical to the one-level model INO 2006 but has two levels, one above the other. 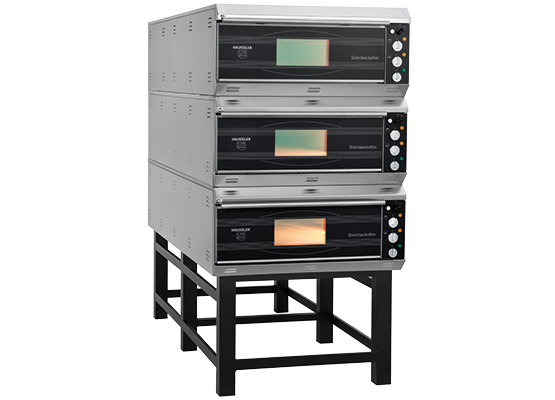 For increased demand, our electric stone ovens also come as 3-tier models. Each tier can be heated independently and operated separately as needed. Monitoring of the temperatures in the baking chamber takes place via clearly visible control lights. As with all of our models, the full fireclay lining ensures perfect baking results. With a baking surface of 70 x 140 cm and thanks to their performance level and high capacity, the models of the series INO 2008 are the ideal appliances for direct marketers and small businesses. The entire cladding is made of stainless steel, and the doors are manufactured from a high-quality stainless steel-glass combination. The INO 2008/2 provides space for approx. 40 loaves of bread per baking process. The baking surface of 70 x 140 is identical to the one-level model; the capacity can be doubled, however, with a space-saving second level. The entire cladding is made of stainless steel, and the doors are manufactured from a high-quality stainless steel-glass combination. With its baking surface of 3 x 70 x 140 cm, you can bake up to 60 loaves of bread in the INO 2008/3. Each tier can be heated independently and operated separately as needed. The entire cladding is made of stainless steel, and the doors are manufactured from a high-quality stainless steel-glass combination. With their baking surface of 70 x 175 cm, the INO 2010 oven series represents the ultimate professional appliances of the HÄUSSLER oven series. With a capacity of approx. 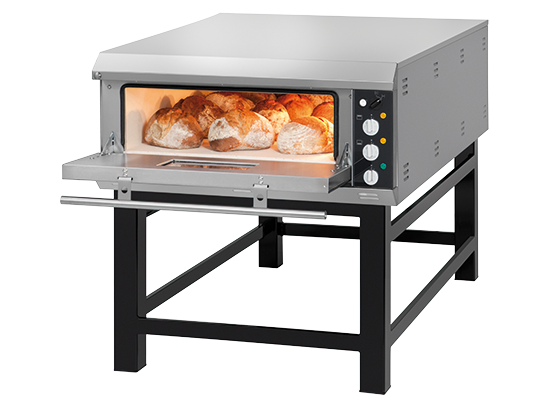 25 loaves of bread à 1 kg on one baking level and an enormous performance capability, this model series meets the most stringent demands of every businessperson, bakery and large direct marketer. The entire cladding is made of stainless steel, and the doors are manufactured from a high-quality stainless steel-glass combination. The INO 2010/2 holds approx. 50 loaves of bread à 1 kg on its two baking levels. All levels can of course be heated independently of each other in this model as well and can be operated individually as required. The entire cladding is made of stainless steel, and the doors are manufactured from a high-quality stainless steel-glass combination. 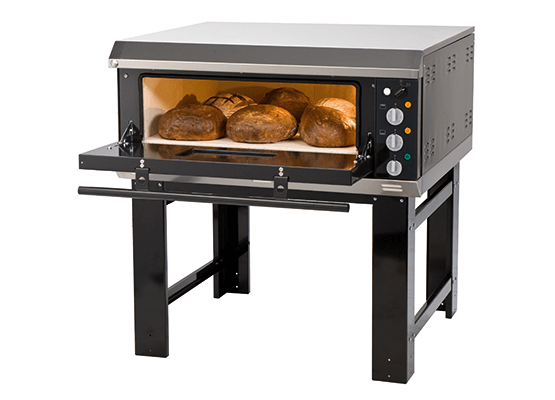 The electric stone oven INO 2010/3 is the largest model that we offer, with a capacity of approx. 75 loaves of bread. With its baking surface of 3 x 70 x 175 cm, this oven can also be used as an ideal production oven. The entire cladding is made of stainless steel, and the doors are manufactured from a high-quality stainless steel-glass combination. 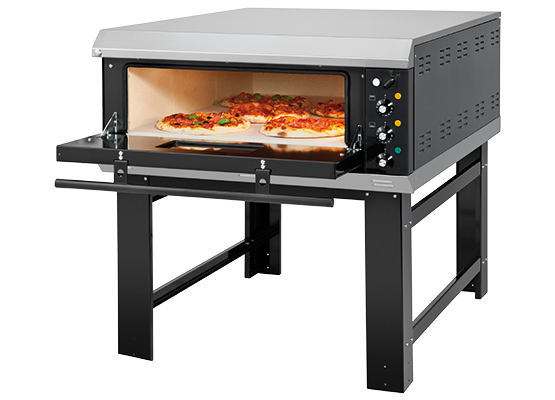 Electric pizza oven: ideal for your catering business! The Häussler electric pizza ovens PIZZA 2004 and PIZZA 2006 will provide a solid foundation for the success of your catering business due to their complete fireclay brick purnishing and the high temperature ranges of 50 - 500° C.
With our pizza ovens, you will acquire an all-round professional technology – with very easy operation. The thermostats for top and bottom heat can be regulated separately and ensure a precise and effective baking of pizzas, flatbreads and tarte flambée. Due to the effective energy consumption of the fireclay bricks, baking for several hours with low power supply is ensured during times of high activity and periods of low production. With a baking chamber height of 21 cm, the PIZZA series can be used very flexibly – from fresh, crusty baked goods, savoury pizzas, casseroles, meat to bread and pastries. 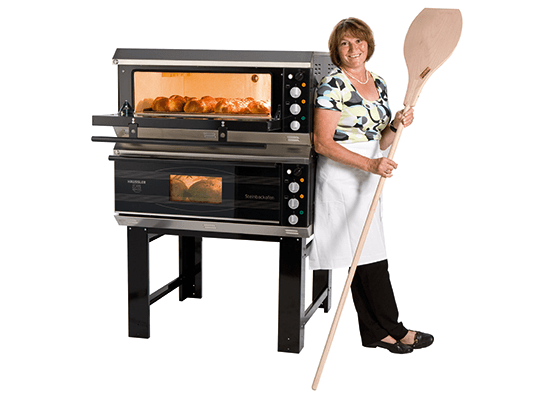 Delight your customers and guests with products from the original stone oven! The baking chamber height of 21 cm not only makes baking pizza possible – bread, meat, small baked goods and much more are also of course successful in it. The entire oven consists of high-quality fireclay bricks made of 100% natural materials. This enables a direct baking of bread and baked goods on the bricks – a requirement for incomparably good baking results. Thanks to the all-round firebrick lining, the stored heat remains in the interior even when the door is open. Each baking chamber has two thermostats for fine control of the upper and lower heat. 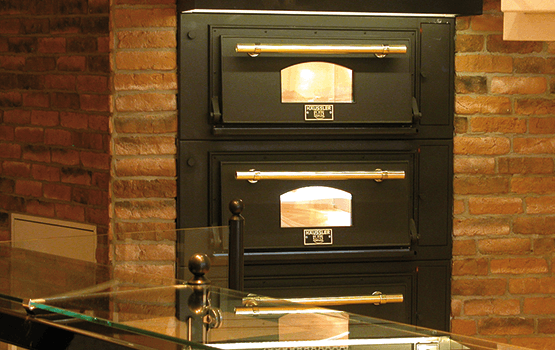 Depending on the baked good, the upper and lower heat can be continuously individually adjusted from 50 – 500° C.
The full firebrick lining of our pizza ovens provides a baking quality according to the proven principle of the wood-burning ovens: natural radiant heat and an optimum baking climate in the interior. Tarte flambée like from the wood-burning oven! Installed in the front cooking area, Le Gourmet is an effective invitation to a spontaneous purchase. Thanks to the complete lining with fireclay bricks, you can bake tarte flambée, pizzas, meat and much more according to the wood-burning oven principle. Le Gourmet’s special feature, however, is the exposed top heat heating elements. These quickly create a high heat and beautiful browning while at the same time you enjoy the convenience and all the advantages of the oven’s complete fireclay lining! The innovative technology – the high-performance HS power system provides full heat – a guarantee for success for all “à la minute dishes”. 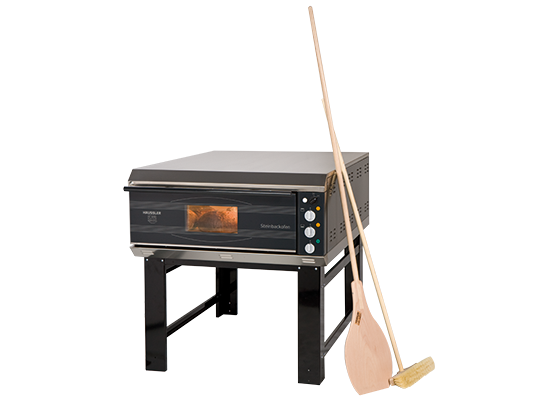 • Ideal for show baking in your catering business! • For tarte flambée, pizzas, bread, meat, small baked goods and much more. Electric stone oven in a wood-burning oven design! 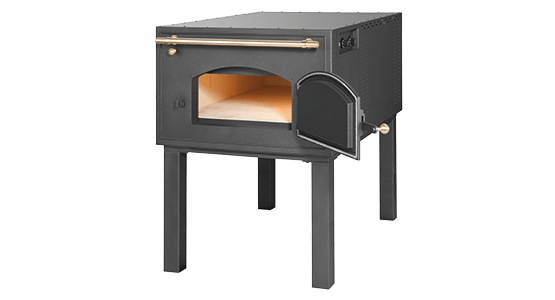 The PARTY nostalgic electric stone ovens impressively combine the technology of the electricstone oven with the rustic and appealing wood-burning oven design. 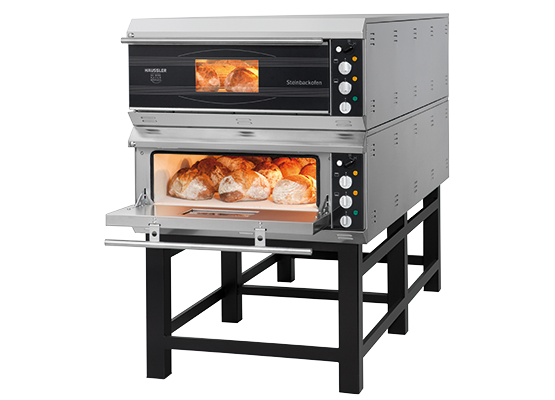 These ovens are ideal for party service, hotels, event catering, market sales, bakery sales area, beer garden and party room. Everywhere where it is important to offer your customers or guests the show of the decorative oven itself in addition to the culinary delights. With the PARTY, you’ve made the right choice. 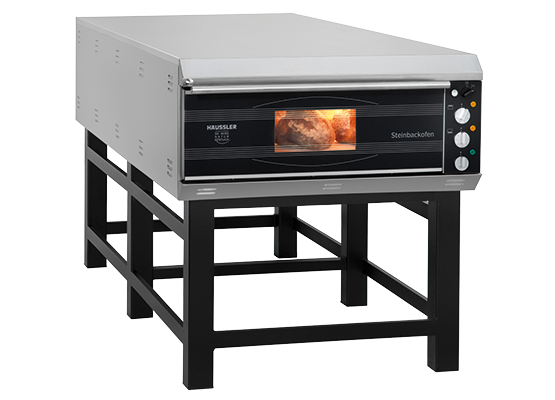 Heat output up to 320° C. With a baking chamber height of 21 cm, this electric stone oven is very versatile! 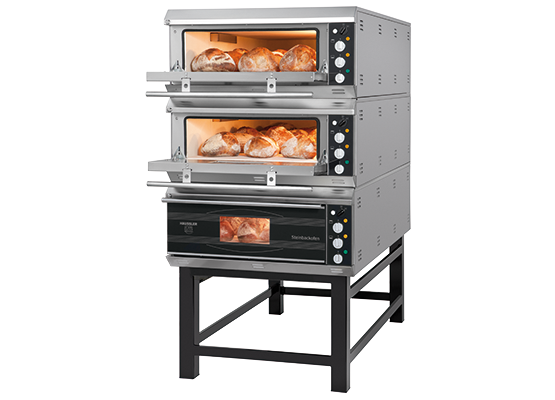 For pizza, bread, meat loaf and all kinds of baked goods and much more ... Also available with a baking temperature of up to 500° C for continuous use by a pizza baker. On request, the Party is also available with wheels and with a nostalgic copper roof. Here you will find our range of products for the electric stone ovens for small business and household use. You will find everything about the electric stone ovens in this brochure, beginning with the INO series for household use and the catering trade to the pizza ovens to the LABOMAT 9000. Le Gourmet, which is ideally suited for show baking, and the PARTY electric stone oven in the wood-burning oven design are also presented.